What is the cost of helping those in need and for what reason do we offer this help? Can we really make a difference that is long term or are we just creating more short term problems? There are many things to consider when making a choice to help. What is our true motive? Is it temporary self gratification that we can hold onto in thought and remember the time when we helped that person or those people? Or did we think it through and come up with a plan that they can sustain? The social structure of the people in need should be analyzed carefully and all things should be considered before we offer help. Communication needs to be clear and there should be an understanding within the entire community whether they want to be involved or not. A lot of things can be misunderstood if left unspoken. These communities have seen people with grand ideas come in, offer temporary help and then leave plenty of times before. Even if we plan to stay forever we must still respect what we do not know and realize we have not and never will walk in their shoes. So we must really think all things through and try not too get emotionally involved to our work. It’s difficult but this attachment will only damage all that we want and need to do. Not knowing the cost of change will sometimes bring about a heavy price. I have been working closely with Djimy and have been teaching him yogic philosophy and movements. From the first day his interest in both has been from the heart. So much so that he wrote a letter to me expressing how could he create an organization within his community that could offer positive change. He continued stating how “there are some bad people here and I know you will have a positive idea for me.” I then explained to him that I would like to teach him to become a teacher of Yoga. I would teach him basic breathing and movements so that he could easily teach others and he was all in. We worked together at least 3 days a week for 4 weeks. He could not participate everyday because of not having enough energy due to the lack of food (the tourist industry has drastically dropped and more people are struggling to survive in the Batéy). So those days we would talk a little philosophy which was quite difficult for the both of us because of the language barrier but he eventually got me. 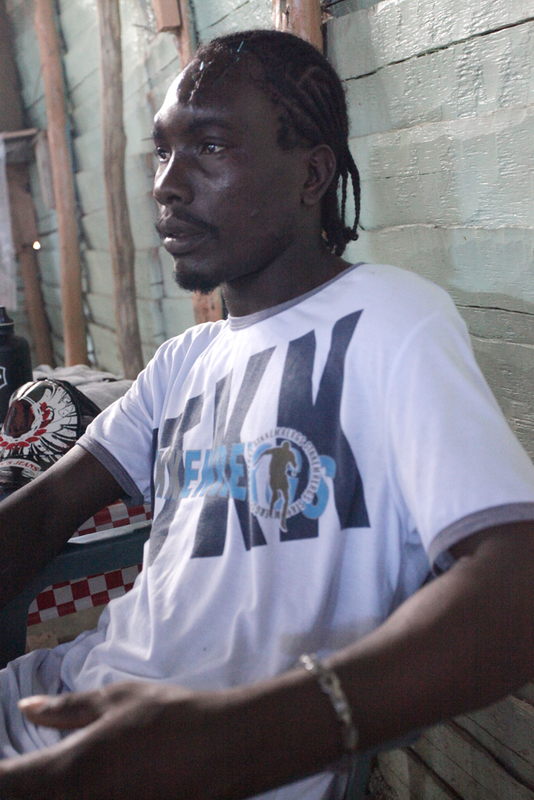 As the weeks passed more people from the Batéy began to show up to train and Djimy had the opportunity to teach. He didn’t really know everything but he still taught as if he did. Taking the role as a leader without hesitation and the others followed along without question while we both taught. On Saturday December 3rd he the opportunity to help me teach a class of people from the Batéy and tourist who were visiting that morning. The class went well and Djimy did an excellent job helping out. That same day he wrote me a small note saying that his birthday was on Monday and he wanted me to join him for a small get together at his place. Sunday passed and Monday I went in to teach class at the Batéy. I walked up and someone approached me and said Djimy was sick so i went to check on him. He came out of his small room with 2 huge poorly stitched gashes on his head and 1 on his hand. We went to the spot were we train to talk about what happened. He explained to me that 4 Hatian guys (1 who lived in that Batéy) came to his door telling him to give them money and as we he was explaining that he had none, he pushed the closest guy away. As he tried to slam and lock the door he saw a machete in the corner of his eye. He caught the blade with his hand and kicked the guy but then stumbled and fell. That is when the men continued to attack him, hitting him twice on the forehead and on the shoulder. I expressed how I felt somewhat responsible because these men probably believed since there was so many people in his place that Saturday that he had to have gotten money from them. I told him that I didn’t want to put him or anyone else in harms way, so I would stop have teaching there. He brushed it off and said there is no need to stop thats just how it is here sometimes. I still tried to push the issue but other guys had showed up for class by then and I decided I would teach that day and think about it later. Not even a full day after being attacked Djimy still found the strength to help teach class. He put a red Philly cap on over his stitches and taught as if nothing had happened . So I am left wondering, if this was because of us working together. Did he already have problems with these people? Should I have looked at the community closer and thought of what effect my presence may have on it? I am asking myself all the questions this article started with and I am considering whether or not to continue. Class is still set for its’s normal time but I will talk to all the guys who want to train and see what they think about it. This will be my deciding factor but if they want to learn then I will not be the one to deny them. < Previous Building from the inside out. Next > Just let go and you will see.